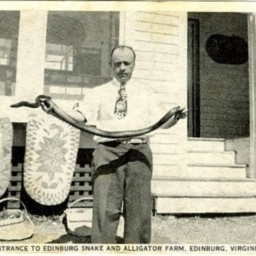 Postcard with a picture showing a man holding a snake in front of the entrance to the Edinburg Snake and Alligator Farm located in Bowman's Crossing. 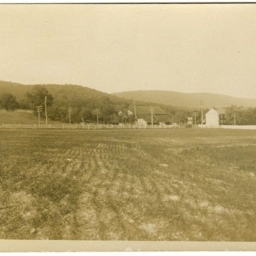 Postcard with a picture of an unidentified farm, house, and barn in Shenandoah County. 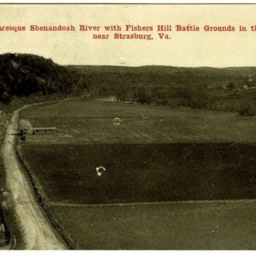 The Picturesque Shenandoah River with Fishers Hill Battle Ground in the Distance, near Strasburg Va.
Postcard with a picture of flat land and Route 11 near the Shenandoah River outside Strasburg Virginia. 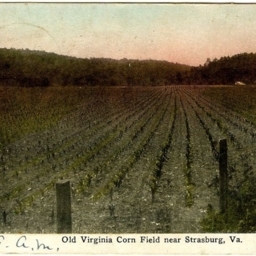 Old Virginia Corn Field near Strasburg Va.
Postcard with a picture of a corn field located along the Shenandoah River near Strasburg Virginia.